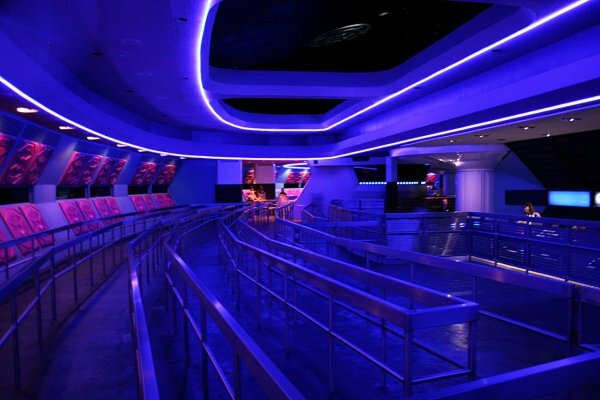 The Space Mountain wait time and Space Mountain ride time for the roller coaster at Walt Disney World, Magic Kingdom, Tomorrowland, Orlando, Florida are discussed in the this article. 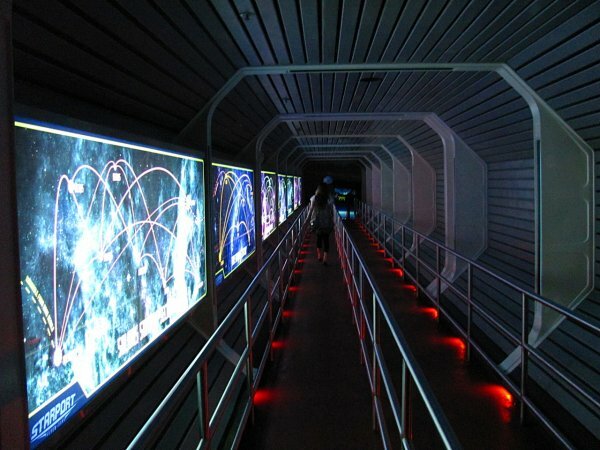 Also mentioned in this article is the Space Mountain line / queue and how it is setup. The first section in the article gives an overview on the wait time (queue time) and how to get current wait times for the attraction. Following the wait time overview, details on the ride time for Space Mountain are mentioned. After reviewing those details we then go over how the Space Mountain queue or line is setup. Now lets go over the ride time. Wait times for Space Mountain will vary depending on the amount of demand for the ride and the amount of guests at the Magic Kingdom. The ride usually has one of the higher wait times among the attractions at the Magic Kingdom. The new Seven Dwarfs Mine Train looks to have taken over as the ride with the longest wait time, followed by Space Mountain. Space Mountain queue times (wait times) are usually anywhere from 30 to 90 minutes or a half hour to an hour and 30 minutes. On low guest traffic days, the ride wait time can be really low (10 minutes). Also early morning and late night hours can have lower wait times. On days with high or peak traffic you are usually looking at a 45 to 90 minute wait time. Now what days have peak traffic? The days with peak crowds at Walt Disney World can be estimated by looking at Disney's Florida annual pass levels. Before going into details, weekends are usually more busier than weekdays. This would make sense as more people are available during weekends vs weekdays (Monday thru Friday). Disney's Silver Pass does not allow entry to the parks at certain time periods that have a higher number of expected guests. 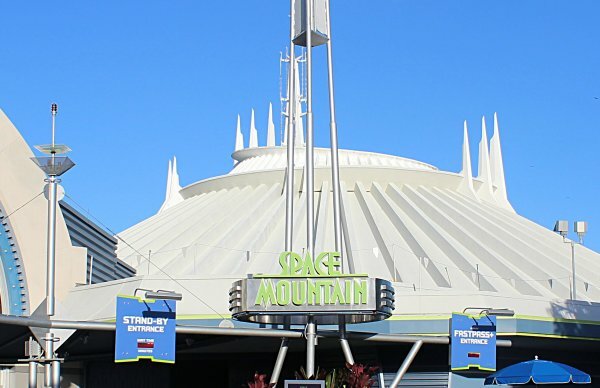 These days can be expected to have peak traffic and higher wait times for Space Mountain. For 2017, Disney has June 5th to August 10th and December 18th to January 2nd 2018 blocked out. Also in 2018, March 25th to April 6th are blocked out. These dates represent the summer vacation, winter holidays and spring break seasons. If you go to the theme park and ride Space Mountain during those seasons you are looking at a higher wait time (45 to 90 minutes). Above Space Mountain Wait Time Sign / Front Entrance photo originally by Theme Park Tourist on Flickr and Wikimedia Commons. Modified by NavFile. Photo released under a Creative Commons License. Space Mountain can have very high wait times during high guest traffic days at the park. Summer is one of the top seasons for visitors at the park. For example on 7/3/2017 (Independence Day Eve) around 2:37 PM (Local Time / Eastern), Space Mountain’s wait time was 155 minutes or 2 hours 35 minutes. By 3:08 PM the wait time increased to 180 minutes or 3 hours. If you are in the park during the peak summer season and near a holiday, you may find that Space Mountain can have some very long wait times. Using FastPass+ to get on the ride is a good choice during peak days. How do you get current wait times? Walt Disney World provides current, up to date wait times via its My Disney Experience Apps. The app is available for Android and the iPhone (iOS). The apps can be downloaded on the Google Play Store and the App Store for the iPhone. Here are the links to them: https://play.google.com/store/apps/details?id=com.disney.mdx.wdw.google https://itunes.apple.com/app/id547436543. When opening the app you are automatically on the wait time page. 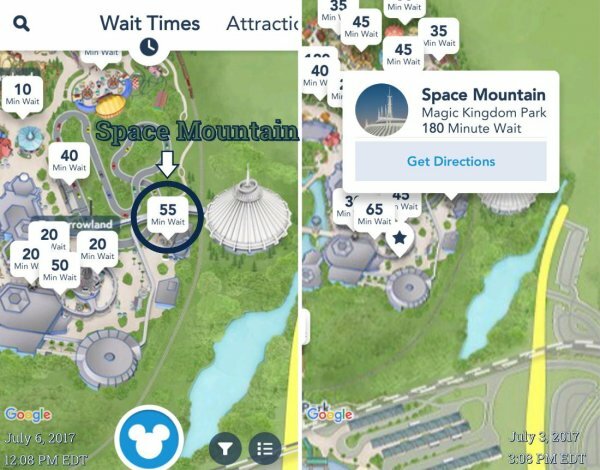 You then navigate to the Magic Kingdom on the map, zoom in, and the wait times will be shown on the map just like below. The wait times are not on Walt Disney World's website, however, you may be able to see them when you login to the My Disney Experience section. After waiting in line or using FastPass+ to get on Space Mountain, how long is the ride itself? The Space Mountain ride time is approximately 3 minutes (3 min). Some other places are reporting that the ride time is 2 minutes 30 seconds. The 3 minute time is measured from the moment the ride starts rolling and includes the stop that is made before launching into the tunnel. This time is likely to be more accurate and represent the ride time. In some cases the ride time will exceed 3 minutes, depending on ride conditions. The Space Mountain line is one of the interesting lines in the park. The Space Mountain queue starts at the front entrance where there are two lines, one standby and one FastPass + line. The line route takes you “underground” where you make your way to the ride. The line does not have many turns like other waiting lines and the route is also dark with minimal lighting. At the end there are some “zigzag” routes that are only used if there are a lot of people in the line. Disney has added interactive games along the line route to help keep guests entertained. Space Mountain has two sets of tracks that are mirror images of each other. One side is called “Alpha” and the other side is “Omega”. Guests in the stand by line will usually take the Alpha side (on the left) and FastPass+ guests take the Omega side (right side). The boarding process starts at the end of the line where a cast member will guide you to stand on a certain number to board the roller coaster. Above photo of the Space Mountain Line or Queue by Loren Javier on Flickr. Photo released under a Creative Commons License. Above photo of the Space Mountain Line ZigZag portion by William M on Wikimedia Commons. Modified by NavFile. Photo released under a Creative Commons License. There are many line or queue videos for Space Mountain. You can view some of the top Space Mountain queue videos on our video page for the ride. The first video on our video page gives a good overview of the line for the attraction.